Pros: Simple, resembles check register and most people can use it effectively immediately. It is free and malware free. More interested users can scale up their use to include complicated accounting steps (year end closing, splits across accounts, etc) as much as they wish. Cons: Some features, such as initiating a split, or finding the budgeting functionality, can be non-intuitive. Overall: GNUCash is an open source free package that works much like the for-profit Quicken program without the spyware (content guard) bundled in by Intuit. On the most basic level you simply fill in your checkbook register. If you want to learn a small amount, you can also download your bank statements in various formats, including Quicken format, and click File Import to auto-magically insert them into your checkbook register. I use GNUCash on my desktop, over my LAN to a server, and over Internet via my SSH connection. Those who delve deeper will find this is actually a double entry (professional) accounting system with any number of ledgers you desire to create. You can split transactions just as you would in a paper based accounting system to show all the elements for the cash flow on every transaction, or use any of the (perhaps 50) built in reports to generate a balance sheet, income statement, and other common accounting reports. In this sense it leaves Quicken in the dust and is far easier to use than QuickBooks. Also, GNUCash will leave your payroll percentages alone while Intuit has programmed QuickBooks to delete all your payroll percentages every time you use it after February each year unless you buy the free IRS Circular E from Intuit each year. The Intuit rep explained to me that I had no choice and was forced to buy this free data from them "because business owners are too stupid to enter the (6) percentages themselves". Yes, she actually said that. GNUCash is not a "pretty" program but it is extremely functional and free. 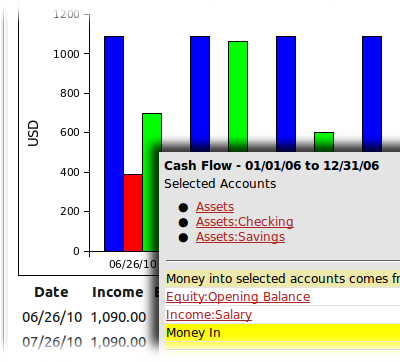 The downside is some non-intuitive behaviour when splitting an already entered transaction (which you will eventually figure out), and the rather obtuse way in which you enter budgeting data - the budgeting report however is very straightforward and allows you to change dates and which accounts are included very easily. It also provides a paper trail after every session as a separate (timestamped) file for review or recovery purposes. If you want more privacy and less cost in your company (or personal) accounting software this is a great choice. If you want for-pay customer support instead of using a FAQ or video tutorials to get answers, don't care if a glitch could lock you out of your own data when ContentGuard decides you're suddenly "not authorized", think business owners are stupid, and prefer to buy every feature for hundreds of dollars each, then by all means buy one of Intuit's packages. Recommendations to other buyers: When you hit a snag, google search on GNUCash how to (topic) and you will usually find multiple explanations with examples. Pros: I use it to keep my personal finance. It's also a professional tool so it has many features that I will probably never use, but they don't get much in the way. Double entry is a powerful tool when you get the grasps of it, making it possible to bind together transactions between more than two accounts. It can also track stock prices and it's possible to update them with some setup. Charts and reports are available and very flexible. Cons: If you're not a professional accountant, you'll need some time to get used to "double entry", and I still get confused sometimes. The setup of stock prices update is definitely not easy (esp. on Linux). Charts and reports require quite some work to get the most out of them, the presets are not that insightful. Pros: Love that it's free and that it works all the time, with no fuss and no muss. It might take a bit to get up to speed on how to use it, but individuals familiar with other accounting programs shouldn't have any trouble. It even has a mobile piece (Android) where I can track trip expenses. Cons: There is a steep learning curve at the beginning - particularly for those who may not be familiar with double-entry accounting. The mobile piece needs to have a better way of integrating with the main data file. There is also no way to have multiple users accessing the main data file. Overall: Like the fact that it's free and that it gets the job done - ideal for small businesses or contractors who want something simple and free. Doesn't have a lot of bells and whistles but it's a great way to track business expenses and income. Pros: The ease of use, the double entry accounting, and the different functions, reports, and tools are excellent. The tools for different currency accounts are excellent for our international business. Cons: There is a learning curve. Small things, such as learning how to print a register, can be a bit tedious in learning and doing the first time. While there is a user's manual and searching for assistance online is available, finding the answer to a question or learning how to do something often takes much trial and error and just simple experimenting with clicks key punches. Overall: No cost for product or use of product. Saves time. Very productive. Ease of use. Pros: I like that GnuCash is free, open source software, so there is no cost to use it, so I was able to implement it without putting forward a budget, and this was able to let me implement it quickly. Cons: It isn't as polished as paid-for software, but it is also more flexible, so I think the negatives and positives on this issue balance out. Overall: I implemented GnuCash when my department did not have a digital invoicing system in place for internal invoicing. We invoice between departments, and we were doing it on a spreadsheet, which was not optimal as sometimes mistakes were made. I implemented GnuCash myself, and I was able to do this as it was free of cost to download and use. We now have an internal billing system that tracks accounts payable and accounts receivable, and it is much more accurate and efficient. Pros: It is free, just a click to download and install on Windows. A quick install from the application manager in Linux/Debian/Ubuntu. Cons: It does not support multi-users. Meaning if you have the file open on one system, you can not open that company on another. So if you want two people to be able to invoice at the same time, they can't. Overall: I have been using it for years for my personal needs. I would recommend it to more customers / clients if it could be used on multiple systems. As it stands though, I have recommended it to numerous people that just have one person in accounting / sales / etc. Pros: Very nice functional multi ledger, double-entry accounting with QIX/F files and bank statement imports. 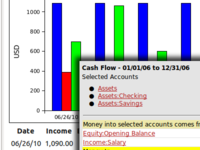 You can create balance sheet and income statement financial reports which you can customize and print. Cons: Setting it up takes some work specially when you use it to for business, but GnuCash has a thriving community with lots of information in the web and your bookkeeper should not have trouble finding answers. You can also find resources that could help you further customize the application to suit your business. Overall: I will continue to use for my personal and business needs. Pros: The account setup is customizable and fairly easy to modify / update on the fly. The ability to automatically grab stock quotes (though recently has become a little more difficult) is very helpful. I use the reports often to understand how my investments are going as well as tracking expenses and adjusting my spending accordingly. Cons: The mobile app does not easily import transactions into the database. A cloud based database would be more useful as I need to be at my computer (or one linked to my cloud drive) to access the database. While I understand the need for it, the double entry book keeping system takes a little getting used to. Pros: After exploring several other feature-rich software options to help me with the basic accounting I needed to perform in my role as Title 1 Coordinator at a school, I found Gnu Cash. The interface and basic functionality was exactly what I needed. It was simple to set up and not overly complex. The result of this was that I was able to easily navigate GnuCash with ease and confidence. I stuck with this software after the others I used had failed. Cons: At the time I relied heavily on this software, it wasn't accessible from anywhere except my desktop computer that I primarily worked at. It didn't have any type of cloud sync. Pros: I can setup the accounting structure however I like. It uses double entry bookkeeping to keep track of income and expenses. Does a good job tracking investments and can calculate capital gains based on lots bought/sold for better accuracy. Lots of reporting features. Cons: Getting used to the double entry system took some time. It used to be able to get online quotes for stocks, but that feature no longer works well. Not their fault since Yahoo broke it, but there isn't a reliable fix yet. Pros: GnuCash is great for both personal and small business use . It's spreadsheet like design makes it easy to keep track of income and expenses and make the necessary adjustments .It can be customized to your specific needs and is free to use . Pros: In searching for an alternative to Quickbooks for a new startup business, I stumbled upon Gnucash as a cost-effective alternative. 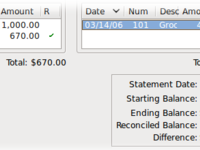 If you are comfortable with Quickbooks, Gnucash is a breeze to catch onto, set up, and use on a daily basis. It mirrors the setup very closely and is simple to set up. Cons: Gnucash is not set up to automatically integrate with very many other software applications, like its main competitor, so it could lead to a lot of manual data entry if this aspect is not thoroughly researched prior to setup. Helped me immensely with reaching my budgeting goals . Pros: Very easy to install and use .It is designed to look like a spreadsheet, so you quickly get used to using it .You can make the graphs as detailed as you need and as many incoming payments and expenses as needed . Cons: I honestly have no complaints .It's a free program that does what it says it does . Pros: GNU Cash is free to use . It has an Excel like design ,quickly making you familiar with the process .Your finances will be more organized and you'll be glad to have it . Cons: There is a lot of manual data entry at the beginning . Pros: This is perhaps the best free open source accounting software for personal finance which is also used for business accounting by SMEs. As there is a large community of users, one can stay assured of the latest updates as well as forum support. Cons: This is not cloud-based. One needs to download the software. There is a learning curve. One needs to follow documentation which fortunately is well compiled. Overall: No need to pay for subscriptions. No fee and completely free. Pros: GnuCash has revolutionized the way I budget . The way expenses are listed really helps me realize where I should stop spending so much .One of small number of apps I'd gladly pay for ,however it's free . Cons: Especially if using it for a business ,more comprehensive accounting sheets are hard to properly create .Exporting your work can also be more intuitive on the mobile app . Pros: For those who are searching for a free accounting software for their individual or small business needs, GNUCash is perhaps the best given the robust features incorporated and a large community base. Being open source, the possibilities are endless for developers who can always add new codes to suit the needs. Cons: Unfortunately, the support is not fast if one faces a hurdle. 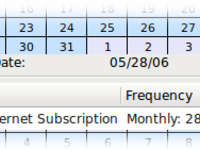 As a user, if you want to post a query on their forum, you need to subscribe. In my case, I could not understand this condition and so my query was reverted back. GNUCash perhaps should address this point. I then posted my thread to another popular forum (StackExchange: Personal Finances & Money) and received first reply only after one month! Overall: For my business needs, I believe GNUCash is the answer though support when faced with a problem not always that fast. Pros: I like that this software is free, with no hidden payments unlike other software packages we looked at. Cons: Because it doesn't seem to be very popular, I had to learn how to use it from the manual. But it is compatible with other data formats. Overall: I needed an accounts software package that was able to generate invoices and track payments, and GnuCash has been working well for us. Pros: The application is really reliable, easy to maintain and quite flexible. Overall: I am using gnucash for my personnal usage. Cons: Manually adding all of your income ,expenses and other misc items takes a lot of time. Pros: Easy to upload statements from bank, credit cards, etc. into the program. Cons: Some questions are difficult to find answers in the documentation. 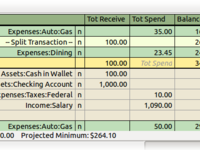 Overall: I am using GnuCash to track income & expenses for my business, plus rental properties & my personal accounts. It took awhile to fully understand the double accounting system, but the documentation was pretty easy to follow. The software's intuitive nature when uploading new bank statements is nice... until a transaction needs to be categorized differently from the original. Overall, I like the program and will continue to use it to track my spending. No reason not have this app . 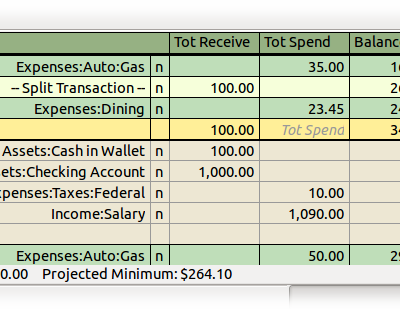 Pros: GNU Cash helps me keep track of my budget and ensures I meet my financial goals .It works like a standard spreadsheet ( a more automated one ) and is free to use . Cons: The initial set up where you enter your income and expenses ,can take a lot of time to properly organize. Free ,neat financial helper . 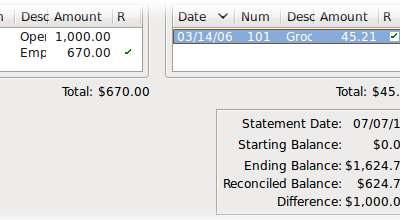 Pros: GnuCash really helped me keep my personal finances in check . It is free to use , so that only adds to the financial benefits you get from it . Cons: Constantly entering your expenses can be tedious ,but well worth it . Overall: I would recommend it to any trying to get their finances in control. Pros: Simple Accounting Book Platform for small business finances. Keeps me in check with my spending and earning and everything nice and neat, for zero dollars, Thank you. Overall: I use GNU Cash to keep my small business accounts. It's simple and straight forward and keeps my finances in check. Best of all it was free and a permanent program on my computer. Comments: It's ok, not as impressive as others I've seen. You can customize it and it's rather simple to figure out if you're a beginner. Pros: Great interface, user friendly, smooth, easy installation.